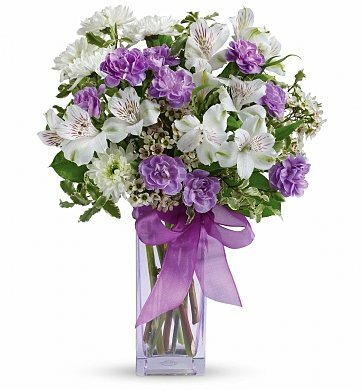 The ultimate lavender-lover's bouquet, this gleeful gift of white and lavender blooms is delivered in a pretty pale lavender vase they'll cherish forever. Lavender organza ribbon adds that gifting touch. Upgrade to Better and Best Versions to include lavender roses in your arrangement! Waxflower, Lush Greenery and more. Standard Arrangement Measures 13" x 16". Lavender Laughter is a hand delivered gift. These gifts are delivered by one of our local design centers located throughout the United States and Canada. Same day delivery is available for most gifts when ordered before the cutoff time. The cutoff time for Lavender Laughter is 2 PM in the recipient's time zone. I had to make an apology that should have been made 6 months ago. The flowers helped me make this happen! My sister in law loved these flowers and the purple vase! The flowers were delivered on-time and hotel staff or the florist deliverer brought it up to the room, despite a site change I had to notify after I placed the order. The presentation was accurate and reasonably consistent in the photo, although the large, purple flowers were tinted roses instead of carnations. My wife enjoyed the fragrance of the roses, which cannot be said about carnations, so that's a win. All the flowers were open and healthy, and it lasted the five days we were there. My mother has never had flowers delivered to her. When she received the flowers she cried. Although I was not there, I completely understand that this meant a lot to her. Due to your quick service, my sister received her flowers the same day I ordered them. While the flowers were not as pictured, it was a nice arrangement just the same. Thank you! Absolutely beautiful..... was a real day brightener for the recipient! My niece said they were beautiful. Thank you. I had such a bad experience with the competition I came to your site. A much better choice. I liked the selections and I liked the cost. My niece loved the flowers.